Create loops on either end of webbing, stand in one of the loops and pull on the other for isometric exercises. Slip a board through one of the loops and a dowel through the other. Stand on the board and perform isometric exercises with the dowell. 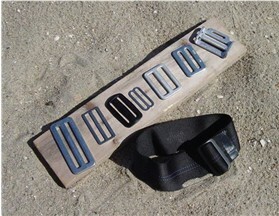 You can quickly adjust the length of the webbing for various exercises. Secure one end of looped webbing by closing it in a door hinge or by looping it over a wall hook, and then utilize the other end for any type of exercise you may want to do. 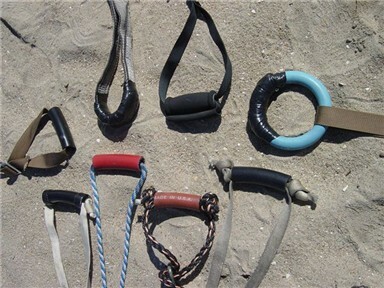 Attach a Four Paws Ring, as seen on the "Isotonic" page, to one end of webbing and utilize the combination for various isotonic exercises; hand held exercises of varying lengths, stand in the ring and pull on the other end of the webbing, slip a dowel through the ring while securing the other end of the webbing and perform an isotonic curl, or press. The possibilities of uses for webbing as an exercise tool are endless! After cutting a length of webbing, singe the edge under a flame to seal it and to prevent it from unraveling. Laminate surfaces together that are going to be sewn to hold them in place. Use upholstery thread for sewing. Begin by running the needle end of the thread through once and then over and through again so that both ends of the thread are sticking out on the same side and are about 1/16", or less, apart. Draw the thread so that one end of the thread is protruding about 4". Taking both ends, tie the thread into a square knot and then begin sewing. After having sewn all the way around and back to the beginning, finish by tying the ends of the thread into a square knot. Either that or invest in a sewing awl. 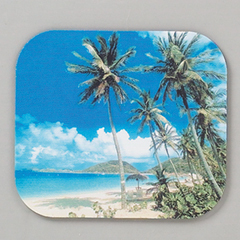 The humble mouse pad. It lurks, innocuous and unnoticed, in many a household. Yet, herein lies the perfect solution to that padding you suddenly realize you need - on your gripper, or for whatever other project calls for some good padding. Don't toss out old mouse pads. And carpet remnants, too. You can usually pick up carpet remnants for free. Just think about some of your exercise needs where you could use a good, thick, slab of carpeting. 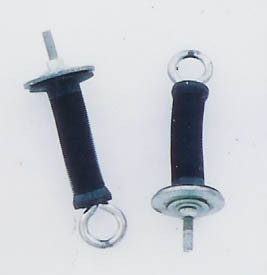 Cut the threads off the ends of two U-bolts and cover those ends with thread protectors. 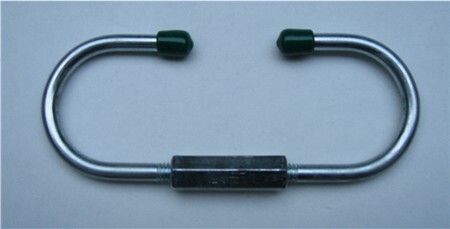 Screw the other two ends into a connector nut as shown. Turn them with enough force to crush the ends together. The link depicted here could slip over a pipe, or whatever. 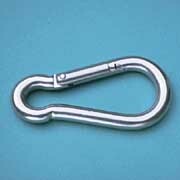 The depicted link was made of 5/16" x 1 3/4" U-bolts and can support my weight - 215 lbs. You can use any number of sizes and thicknesses of U-bolts for any number of purposes. You can also turn the U-Bolts at different angles to each other, if such needs should arise. Here's another versatile item you can make when a Quick Link won't suit your purposes. 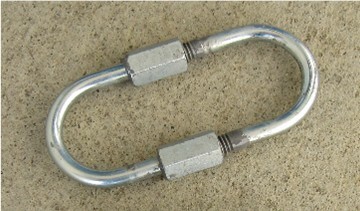 The Master Link shown here was made of two U-bolts, coupling nuts, and JB Weld. If you want a link that is shorter than the two U-Bolts together, then cut off the excess threads, but DO NOT cut off lengths that leave threads on the U-Bolts less than the lengths of the nuts - at least not on one of the U-Bolts. 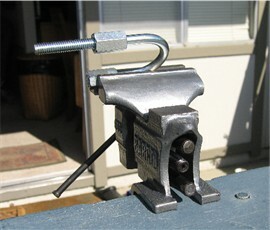 The remaining threads have to at least meet flush with the edge of the nuts when the nuts are screwed all the way on to a U-Bolt. I made two of the links shown here to be used on my Deluxe Double-Fisted Gripper as seen at the top of the Grip ll page. To make one of them, I used two 1-3/8" x 3-11/16" U-bolts. As it turns out, the minimum number of threads left on both U-bolts created just the right length of Link needed. I first screwed the long coupling nuts all the way onto one U-bolt and then sawed off the exposed threads using a hack saw. On the other U-bolt, I screwed on the nuts that were provided with the U-bolts and then I sawed off the exposed threads on it. After sawing off the threads, I rotated the nuts back and forth around the cut ends a few times to ensure that the nuts will be able to be screwed back on after I'd removed them. Next I applied JB Weld to the threads, screwed the coupling nuts all the way onto the U-Bolt with the longer remaining threads, aligned the other U-bolt, and then screwed the coupling nuts onto it. 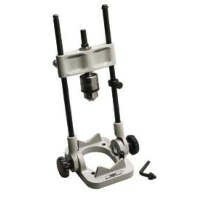 When doing this, you want to make sure that you make an immediate connection with the coupling nuts onto the threads of the U-bolt, and that you don't strip the threads in the process. The Link shown above is a closed link. You could also make your own quick link by cutting the threads on one side of the U-Bolts shorter than the other, and leaving the nut on that side free to rotate. It would be a good idea to epoxy a nut onto one of those threads that you could tighten the other nut up to. Anyway, I finally made my couplers by connecting four pipe clips, two on each pipe, using 10-24x1/2" round phillips head bolts with lock nuts. The photos above show a 1/2" pipe connected to a 3/4" pipe. The connection is strong and stable. 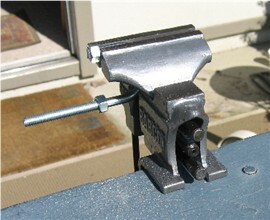 Tapping holes to make threaded holes for bolts is a very powerful technique. And you don't have to cough up for a whole $zillion tap and die set. Just pick your most common assembly bolt or threaded rod size, like 1/4" or 3/8" or whatever, and maybe a smaller one for set screws. Then get the individual taps for those sizes, and a tap wrench. Taps are like $5, a little tap wrench is about the same. You drill a hole slightly smaller than your bolt (they tell you the approx size needed on the tap package). All the info's on the 'net if you don't know it already. It's always a good idea to drill straight holes, and a lot of times straight drilled holes are crucial when building a home exerciser. You don't have to invest a fortune in a drill press. A simple, inexpensive drill guide that attaches to your hand drill and enables you to drill straight into both flat and round surfaces is all you need. Sometimes you have to mix ingredients that will destroy a measuring cup, such as plastic resin, for example. Get some inexpensive clear plastic cups. 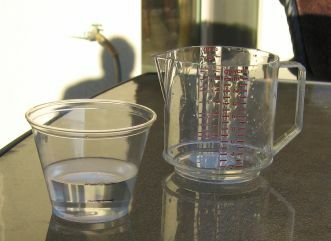 Pour measured amounts of water into a plastic cup and mark the levels with a felt tip pen as shown. Empty the cup of water, dry it, and pour in ingredients to the marked levels. This way you don't loose a perfectly good measuring cup. Instead of tugging on webbing, itself, you may want to grab hold of a handle. You can get some pipe insulation and cut it to length and slip webbing through that. 1" utility rubber hosing and PVC make excellent handles. I took a pair of Lifeline handles and ran 1/4" eye bolts through the holes (where the cables used to be) with fender washers on either ends of the holes and thightened the bolts up with lock nuts. Now, any number of things can be attached to the handles. Here, I took a pair of bicycle handles, ran a couple of eyebolts through them, filled them with Verathane and let harden, and then closed them up with washers and lock nuts. Instead of filling them with verathane, I could have just as easily inserted 1/2" PVC pipes into them. Cut a 5" length of 3/4" PVC and thoroughly round and smooth out the edges, inside and out, with sandpaper. 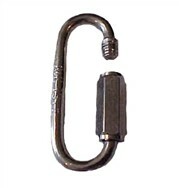 Run a web sling with looped ends through it and then connect the loops together with a carabinger or a detachable link. 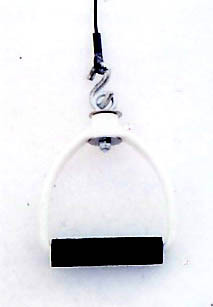 You can draw the web sling through the PVC by unraveling a wire hanger and bending a loop on one end and hooking it through one of the web sling loops. Web Slings come in various lengths, so choose a length that will suit your purposes. You can also make your own web sling by taking a length of webbing and folding the ends over and sewing them for loops. Here's a real easy handle to make: cut a 5" length of 3/4" PVC and thoroughly round and smooth out the edges, inside and out, with sandpaper. 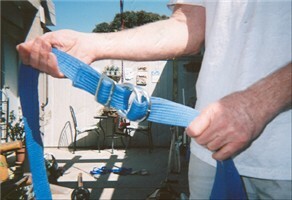 Cut a 24" length of reinforced rope, slip one end through the PVC and then tie the ends into a good, tight square knot. Slip the square knot into the PVC. Voila! Done! 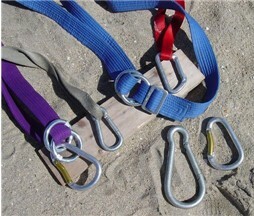 You could also slip a steel "o" ring onto the rope before tying for attachments. Or you could attach a carabinger to the rope. For a handle you can disconnect, cut a 30" length of 1/4" rope and, using about 6" at the end, tie a slip knot around a 3/4" "o" ring. slip the other end of the rope through the handle and then slip a 12" length of 3/8" vinyl tubing over it. On that end of the rope tie a slip knot around a detachable link. You can now easily open up the handle and use it to attach continuous elastic cables or bands, or drape it over a chinup bar for back rows, or anything else you can think of. The vinyl tubing is optional but would be advisable for use with elastic cables. 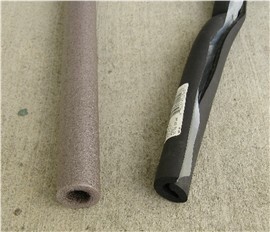 Shown here are two lengths of pipe insulation, the one on the left is close-cell foam, and the one on the right is soft rubber. Both have a thickness of 3/8", both are unbelievably inexpensive, and both make outstanding, ready made grips! For some traction, wrap some athletic tape or cloth tape around them. Get some 1/32" or 1/16" sheet rubber and cut into 3/4" strips, laminate one side and wrap it around. 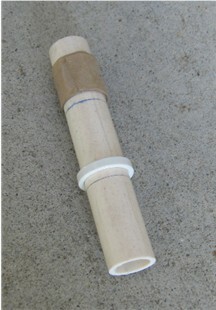 For a wide, durable grip, cut a 5" length of 1" rubber utility hose and force it onto the PVC handle. Use some vaseline to make the sliding easier. When you have worked the hose onto the PVC as far as you can, pound it down the rest of the way. You could use some course sand paper or a file to roughen the texture of the hose, or you could wrap some textured tape around it as mentioned above. For a nice, squishy grip, cut a 5" length of 3/4" pipe insulation and slip that over the PVC handle. From there, you could wrap electricians tape or any of the other already mentioned tapes. Draw the tape taut as you go, mooshing down the insulation. For a real proffesional feel, wrap the PVC handles with some baseball bat or tennis racket wrap. For the same feel of tennis racket wrap, but at a fraction of the cost, wrap some foam mounting tape around a handle, peel off the backing, and then wrap electrician's tape or athletic tape, or rubber strips around that. For the ultimate in decadence, use bicycle handles. For these you would use 1/2" PVC. I got a sheet of this non-skid carpet pad for, what else?, my carpets. As it turns out, this is the ideal grip material! It's made of a pliable, rubbery material about 3/32" thick with a very tacky surface on both sides - not a gluey type of surface, but a naturally tacky surface. This is an ideal material for wrapping around anything you want a good, rock-solid, cusiony grip on. I've used it on my Wrist Roller and it works perfectly! You can layer it if you want to. Cost effective? A length of padded grip wrap for tennis rackets or baseball bats costs $6.00. The strips I cut for my handles cost about seventy five cents. Cut a square of it and hold it against the edge of a door for leaning-back pinch exercises. It's non-slip! One sheet of this stuff will enable you to gripitize everything you have and everything you will ever have forever. This stuff will put a rubbery grip around anything you want a rubbery grip around. Just dip a handle into this stuff and it will adhere to the surface for a professional grip. It can also be sprayed on or brushed on. Plasti-Dip can be found in hardware stores. 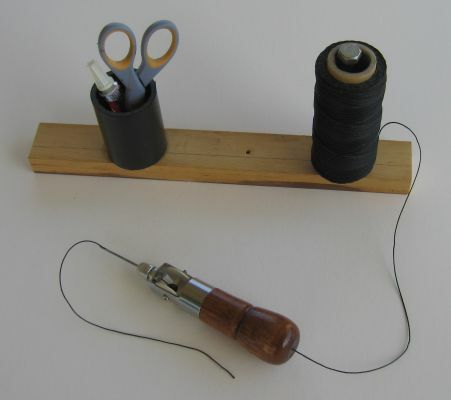 Anyone who does a lot of sewing with an awl knows how frustrating it is to always have to be changing the spool and rethreading the needle when you run out of thread, which is frequently. I solved that problem by drilling a hole through the end cap of an awl, and another hole just under the spool. I then ran thread off of a large spool through the two holes, wrapped it around the spool a few times to retard the flow, and threaded the needle. I'll never run out of thread again. The spool shown will last my lifetime! 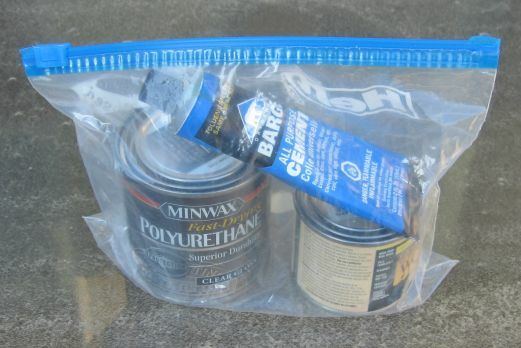 If you use materials that eventually dry up even with lids or caps firmly in place, you can prevent this from happening, or greatly extend the life of those materials by storing them in a zip lock freezer bag. Put what you want to preserve into a freezer bag and then push all of the air out of the bag before sealing it. 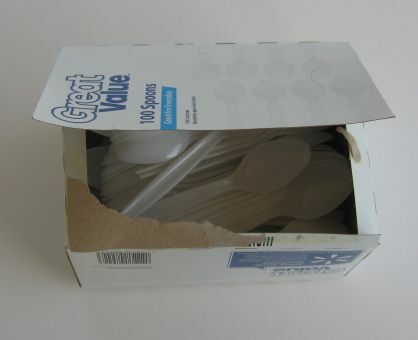 Inexpensive plastic spoons are perfect for mixing things like resins or small amounts of paints or stains. The rear end of the spoon can be used for mixing and applying things like JB Weld and putties. I got a box of a hundred from Walmart for next to nothing. I use a lot of Goop for my projects and I need to use the plastic nozzle that comes with the tube. What you're supposed to do is to remove the plastic cap from the tube, puncture a hole in the top of the tube, replace the cap with the nozzle, if you plan to use it, and then cut off the tip of the nozzle back to where you end up with the size hole you want on the end of the nozzle. The problem with this is that the glue inside the nozzle will dry over night, and if left unused, the entire tube of Goop will dry up. 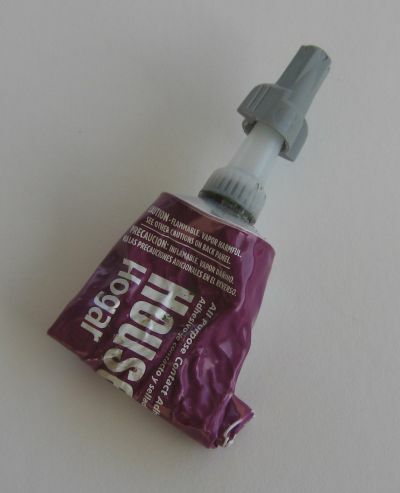 You could remove the nozzle and replace it with the cap, but then you've still got a bunch of glue in the nozzle, and there is no way of cleaning it out. Even if you could, it would be a pain to have to do that every time you use the glue. I tried sticking a nail down the hole on the nozzle to try to seal it, but that didn't do much good. I solved this problem by using a steel threaded wire lug as a cap. I forced it on to the nozzle and pushed down while turning it so that it would cut threads into the nozzle. But the plastic of the nozzle is a bit flimsy, and by forcing and turning the wire lug onto the end, you end up turning the whole nozzle and stripping the plastic threads that are screwed onto the tube. I solved this other problem by first affixing the nozzle to the tube using JB Weld and allowing it to set. After that, the nozzle won't budge no matter how hard the wire lug is turned. It also creates an air-tight seal around the top of the tube. So, between the wire lug and the JB Weld, the tube of Goop is sealed up air tight and can sit indefinitely and still be used right up to the last glorious drop. My medicine ball is an old basketball I cut open and filled with 15 lbs of dried beans. I glued the seam I cut back together then sealed it with duct tape. I got the ball for 2 bucks and the beans were about 30 cents per pound, so the ball cost me $6.50. What are Pool Noodles? Pool Noodles are embarrassingly inexpensive 60" long, 2 3/4"-4" dia, closed cell foam toys with a 1/4"-1/2" hole through the center. For two or three bucks, depending on where you get one, you will be the proud owner of a device that can serve numerous homemade exercise uses! Encase a 1/2" dia. 2' length of rebar in vinyl tubing. This can function as a bend bar. The tubing & rebar fit nicely in a pool noodle & the result is my latest, favorite isokinetic bend bar. Since the pool noodle would eventually tear, I wrapped electrical tape tightly around it. This bend bar is kinder & gentler than others, so, for example you can bend it by using your knee or neck as the fulcrum. In addition to its use as a bend bar, it can also be used in other ways: The tape noodle is "squeeze-able" so it functions as a grip device. Add ring or ankle/wrist weights to one end & use it as a leverage bar. Use it as an isometric device - eg, press it up under a door frame. Pool Noodles can be found at Walmart's or on the web. Here's how you can draw accurate rings around PVC. Cut a sheet of thin cardboard, wrap it around the pipe so that the straight edge is flush at the overlap, and then tape it. Anothr way is to cut the end off of a PVC connector and use that. The connector piece fits snugly against the PVC.